How can I keep corrosion at bay? Why does the roller-furling drum lose wraps? Why is my alternator eating the belt? What’s wrong with my Frigoboat system? Why does my shore power breaker trip? Why does my bilge smell like the head? How do I fix a failed fiberglass repair? How should I lubricate winches? There is a widely held belief among sailors that the secret to getting more people into the sport is to get them on the water. Rob James, owner of Kingdom Yachts Sailing Club, an American Sailing Association school in Atlanta, Georgia, thinks the key is to get them in a boat, but not necessarily one that’s on the water. James says that sailing simulators are the perfect means to introduce people to the sport. The simulator James is referring to consists of a box that houses a tiller-activated electric motor. It has settings that offer between zero and 25 degrees of tilt and can be used with a variety of dinghies that sit on pads on top. These work in conjunction with a five-blade fan to create a realistic sailing experience in which you can tack, jibe and steer a boat and even experience heel. 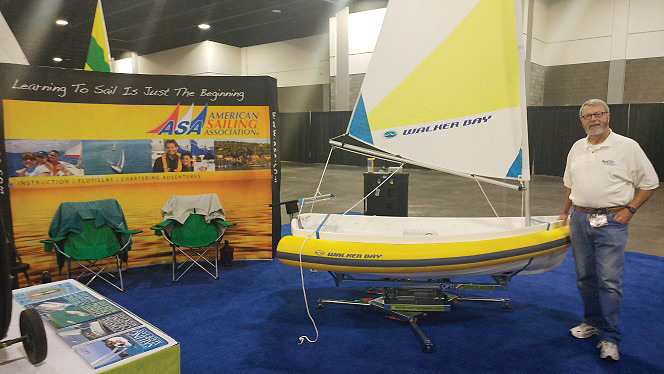 He said there are three simulators in the United States, including one owned by the National Marine Manufacturers Association that is used at boat shows. The simulators have overall weight restrictions for the combined total of the dinghy and the sailor, so boats like the Walker Bay Breeze, which is particularly light, allow heavier sailors to participate. “The Walker Bays don’t load up the simulator so you can put a bigger person on it, and if you use the small Breeze, you can easily pack it up and put it in your pickup truck,” James said. Rob James believes sailing simulators can allay fears and get more people sailing. The same boat can then be used on the water, which James does at his school. On the private lake north of Atlanta where he teaches, students can be sent out in the dinghies with a portable radio after a small amount of instruction. The Breeze has flotation tubes that can be used to ensure a boat won’t capsize. By starting on a simulator, new sailors of all ages are able to get a feel for how a boat moves, without the added fear of maneuvering around other boats or heeling too far, James said. James said that having seen the smooth transition that would-be sailors make from simulator to water, he believes simulators could be the key to get an entire new generation of people into the sport. And even for adults, that could be enough to overcome some of the barriers people have to sailing, according to James. “Sometimes the snooty yacht club attitude is a barrier,” he said. “Sometimes terminology is the barrier. The whole idea of tipping over is a barrier. We can overcome that. We can show them that tipping is OK. It’s safe, and you can try it on the simulator. Subscribe to our free newsletter to get the latest from SAILING Magazine delivered via email. Copyright © 2019 Sailing Magazine, All rights reserved.